January 1, 2019 at 5:37p.m. This month, local video-game enthusiasts are joining countless others across the globe for a two-day creative marathon. Youngstown will host its first Global Game Jam on Jan. 25 at the Oak Hill Collaborative, 507 Oak Hill Ave.
During a “game jam,” software and video game developers – professionals and amateurs alike – team up to make a (mostly) complete and playable video game within 48 hours. The collaborative has previously hosted independent game jam events for about 50 participants, but the Global Game Jam brand is the largest in the world, said coordinator Kendra Corpier. More than 600 Global Game Jam sites across the world are set to host their own game jam that same weekend. 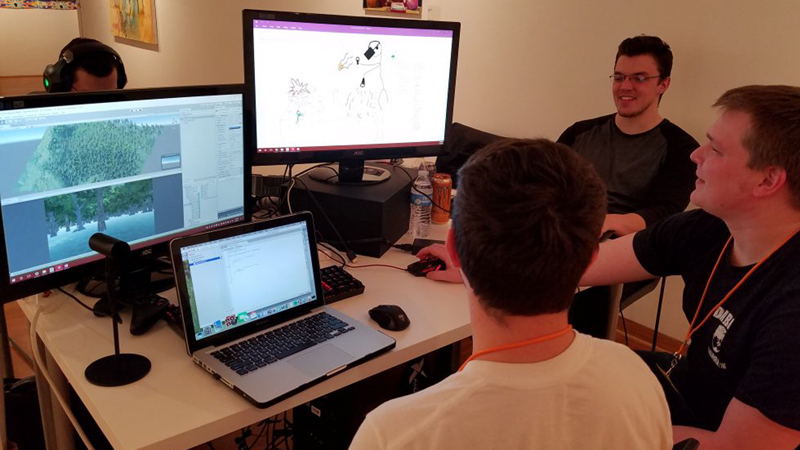 Participants will split into small groups and work feverishly – sometimes through the night – to conceptualize and then program a playable prototype of a video game before the 48-hour deadline, Corpier said. Each entry follows a theme announced at the start of the jam. Previous game jams were inspired by concepts such as extinction, the sound of a heartbeat or waves, she said. Game development software-makers often offer temporary licenses to use their software during the jams, Corpier said. “It’s more about taking what you already know and kind of expanding on it,” she said. “You also get to network with all different kinds of game developers – professionals, hobbyists, engineers. It’s a good networking tool, especially for students or people who are looking to break into the industry. Jeff Rimko, a 35-year-old software developer living in Hermitage, Pa., said video-game design has been a longtime hobby. He coded his own basic video games during previous game jams at the collaborative – one of which he later published on the Google Play store. The simple game prototypes developed during the jam at the collaborative will get exposure through publication on the organization’s website, GlobalGameJam.org. The site’s previous entries are a tapestry of different influences and video-game genres – all accomplished within 48 hours. He said he and others in the Youngstown Game Developers group keep in touch between jams on the free, gamer-centric VoIP platform Discord. Attendance at the Jan. 25 jam is $10, which includes snacks and pizza. Participants may spend the night at the Oak Hill Collaborative, but they must bring their own blankets and pillows. Computers can also be provided for those who can’t bring their own. To reserve your spot, visit bit.ly/2CyRp1F or search eventbrite.com for Youngstown Game Devs: Global Game Jam 2019. January 27, 2019 12:08 a.m.
March 31, 2017 10:55 p.m.